Eating healthy starts with cooking more at home. 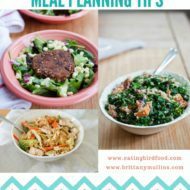 Here are my top tips for meal planning and a FREE Meal Planning Printable to help make planning your weekly meals easy and fun! One of the easiest ways to eat healthier is to cook and eat more meals at home. It’s certainly not impossible to eat healthy when dining out, but restaurant meals are usually larger and higher in calories, sugar and salt. Cooking at home also puts you in control of what goes into the food, which is key. And you don’t need to be a mastermind chef or loving being in the kitchen to cook at home. There are a ton of quick and easy recipes here on EBF (and across the web) that anyone can follow. That said, in order to cook more at home there’s a little prep work involved. You have to decide what you’re going to make, get your ingredients by going to the grocery store (or ordering online) and then you have to get your hands dirty in the kitchen. Not really, but you know what I mean! So let’s go back to that first part — deciding what you’re going to make! This is where meal planning comes in. If you don’t plan ahead, you’ll be trying to answer the “what’s for dinner” question every day and more often than not you’ll skip the grocery store and head to the nearest take-out spot or end up eating cereal for dinner. 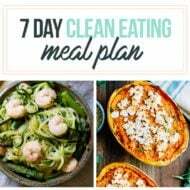 I haven’t always been into meal planning, but once I started I quickly realized how helpful it is and I’ve become much better at it. 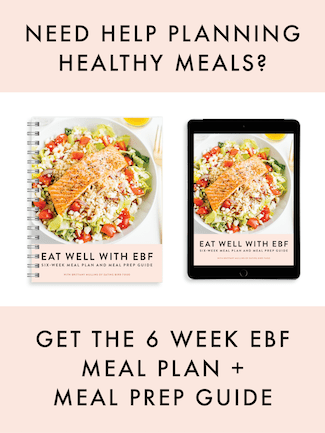 Today I want to share my top tips with you as well as an adorable weekly meal planning sheet that Maria and I put together for you. It’s a downloadable printable that you can get for free, just by submitting your email address above. I’m already obsessed with this sheet! I took it to the store with me yesterday and it’s hanging on our fridge so I can reference it throughout the week. 1. Use the Weekend and Make it a Weekly Routine: Take a little time on Saturday or Sunday to sit down and plan out meals for the week ahead. Take inventory of what items you have in your fridge, freezer and pantry and plan meals around those items. Write down what meals you want to cook, make a grocery list of the things you need and then go shopping. 2. Focus on Dinner: You’ll want to write down a dinner idea for each night, but you don’t have to plan every single meal. You probably already have a breakfast routine and I find that lunch meals are easy to improvise and toss together — leftovers, sandwiches, salads, etc. 3. Prep Ahead of Time: Look at your recipes for the week and figure out if there’s anything you can prepare in advance. If you’re making a soup that requires a lot of chopped veggies, chop all the veggies on Sunday so they’re ready to be thrown in the pot. 4. Only Pick 1-2 New Recipes: When deciding what to do make each week I recommend picking a few tried and true favorites that you could easily make in your sleep if necessary along with one or two new recipes. Breaking out your cookbooks or searching online for recipes to try is fun, but making a brand new recipe each night can be time consuming and overwhelming. 5. Organize your Favorite Recipes: Create a folder or binder to store recipe cards and recipes you’ve pulled from magazines. It also helps to create a place to save online recipes. I like using Pinterest, notes or screen capturing recipes and saving them to a recipe folder. 6. Overlap Ingredients: This is especially helpful for items that go bad quickly. Whenever I buy fresh herbs like parsley or cilantro, I try to find at least two recipes that call for it so most of it gets used instead of tossed. 7. Cook Once, Eat Twice: Look for recipes with a larger yield (4-6 people) so that you can cook once and have the leftovers for lunch or dinner the next day. If you’re serving a family, simply double the recipe so you know you’ll have leftovers. Another idea is to start with a base recipe like a rotisserie chicken on Monday and then use the leftover shredded chicken for another recipe (like this almond butter chicken salad). 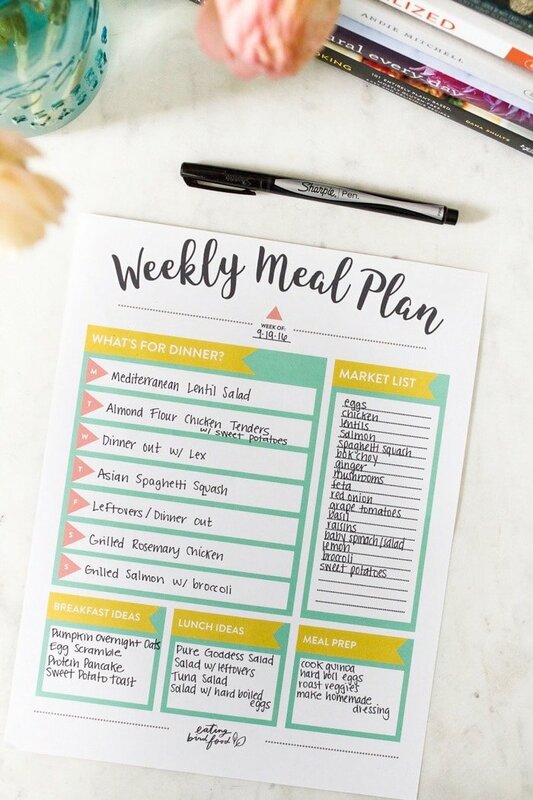 I LOVE your weekly meal plan printout! It’s so pretty and easy to read. Very lovely and helpful! So glad you like it, Kori!! Great tips! I do most of those things already. If I didn’t plan my meals I’d be lost. I need to stay organized to keep up with my family of seven. Have a great week! 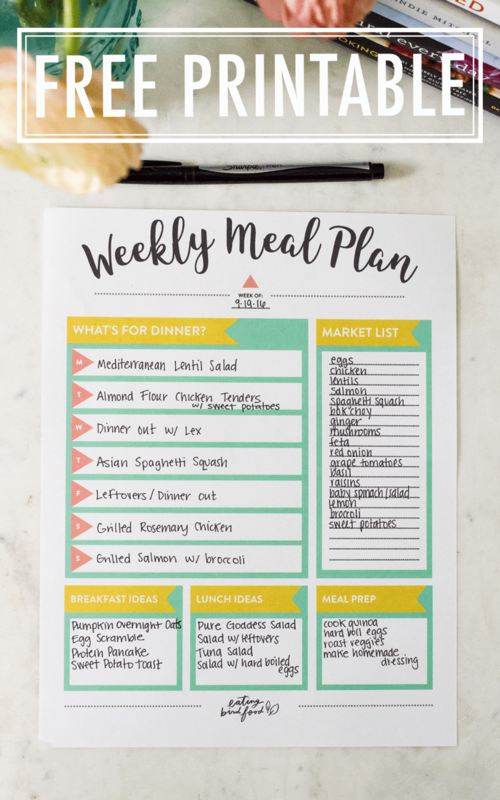 I love this template for organizing meal ideas for the week, it’s perfect! Love this printout! This is exactly what I’m looking for to get my meal planning game on point. 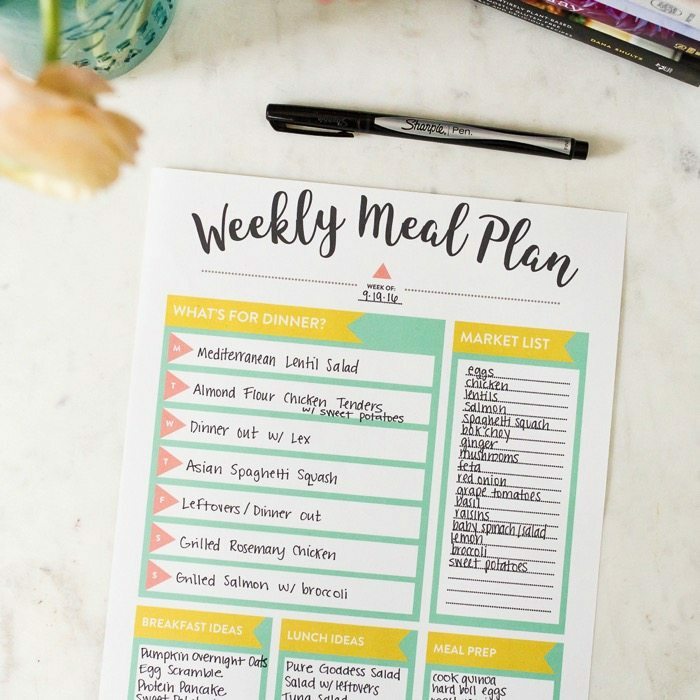 I love the weekly meal plan printout, so helpful! can i just say – you have the NEATEST handwriting haha. if my handwriting was like that, i’d probably get a LOT of work done! love your organization tips! i’m pretty similar, except i like to focus on lunch more than i do dinner. Aww, thank you Beverley. I feel like my handwriting has gotten messy because I rarely write anymore. Just tried to get this beautiful printable and it keeps asking me to subscribe… i already do..?? is there a glitch? Me too please :0) It’s taking me right back to the sign up screen when I try to print it. i just signed up and it keeps asking me to subscribe instead of letting me view that pretty pretty document! please send me one along! I keep getting the subscribe page too. I already did. can you send me the printable please? Yes! Will send this morning. Sorry for the trouble. This is such a great idea. I am a huge believer in meal prep! Can you please send me this printable? I love it!! I got it through the subscription!! Thank you! Hi, I am not seeing how to subscribe or get the printout. Help! Sure! I’ll send it to you.